I have been eyeing Le Bunny Bleu shoes for quite a long time now so I am very excited to have them here hosting a giveaway. The winner will receive a pair of shoes of their choice from Le Bunny Bleu. I will announce the winner on Tuesday August 7th. For all of you, who can't wait until the winner is announced, Le Bunny Bleu have a special coupon for 15% off with the code LOVEELYCIA15. PS. I am a total scatterbrain sometimes and I forgot to announce the Shabby Apple giveaway winner! Anyways...it is Melanie! Congratulations, I will be in touch! I liked Le Bunny Bleu on Facebook!! I signed up for the Le Bunny Bleu email!! My favourites...... Very hard to decide...... hmmmm.... The candy beans slip ons! My favorite pair of shoes are the Dancing Lella Slip Ons! I retweeted about the giveaway! Also, my favorite pair is definitely the signature bunny motif flats! I liked Le Bunny Bleu on Facebook and signed up for their email. I love the Colona Oxfords in black. The colona oxfords in blue are just dreamy! my favorite would have to be the Olivia Oxfords in gray! Brities Oxfords for sure! I need a good pair! Love love love! Ahhh!!! I have been dying for Le Bunny Bleu shoezies for months! I'm crazy for bunnies in general...and now make it possible for me to wear them...eeeeee!!! Their little logo is the cutest!! :) I've liked them for a while now on facebook..so that is covered! :) Same goes for the email list! Hello! I ADORE the Colona oxfords in the turquoise and white. SO cute. Done and Done, their shoes are adorable! as an additional entry, I must say my favorite could be the Jesana Sandals. Sooooo cute. Thanks for introducing me to such a cute shop! I've liked on Facebook and signed up for the email. My favourite pair are Mint Bunny Motive Ballet Flats. Linked and signed up! Loving the Jesana Sandals and this site...Addicted and now planning to buy some pairs. and i think i would have to pick the oxfords! even though those bunnies are super tempting! Liked on facebook and signed up on their site. Those bunny shoes are the best! Facebook liked and email signed up! The mint bunny flats are my favorite! I liked Le Bunny Bleu on Facebook! And pinned my favourite pair on pinterest. the bunny motive flats are always my favorite! My favorites are those blue spring mocasa loafers! Liked on FB and signed up for their emails! Thanks for the giveaway Elycia! I liked on facebook under Kimmy Vera!! Pink Spring Masla Ballet flats! So cute! I signed up for emails and liked them on Facebook. The Bunny Motive flats are soooo cute! I also pinned two different cute pairs on Pinterest! Liked them on FB and signed up for their email list. Thank you! I liked them on FB (Alison S) and signed up! Lve their heart Lizard Ballet Flats! I love the Spring Masala Ballet flats in mint or the Bunny Motive flats - they're both such cute shoes!! I liked Le Bunny Bleu on FB! And I would absolutely adore a pair of the bunny flats! the colona oxfords in black are to die for! And I blogged about the giveaway on tumblr! If I win I would love a pair of the Bunny Motive Ballet Flats in Mint. Signed up and liked on facebook! liked on facebook as user "Mona Zavala"
I love the Bunny Motive flats in mint! Also, I'm totally in love with the Elegant Mesh Oxfords in Beige. my favorite pair is the Black Momas Slip-ons in black! And for which shoes, it has to be the Bunny Motive Ballet Flats. And of course in the color mint! They are so cute! i think the Heart lizard Ballet Flats are super adorable. I like the http://shop.lebunnybleu.com/collections/oxfords/products/colona-oxfords oxfords in black. I signed up for the newsletter! I would love the caramel Brities Oxfords with the yellow ends. I liked on Facebook also. I've been pining over the bunny leather boats shoes! And signed up for their email. Pick me! Pick me! I love love love the oxfords. sign up for emails - check! I LOVE the Bunny Motive ballet flat...so cute! I liked it on facebook as well as signed up for the email newsletter. I adore the Candy Bean Slip-ons. I've liked on facebook and signed up for e-mails! Kelly @ Fashion or Fiction, You can contact me through my blog email. Of course, I love the Bunny Motive ballet flats! Thanks for the great giveaway Elycia! Signed up for the email and liked Le Bunny Bleu on Facebook! Also I love the Ebony Bow Ballet Flats in purple! I would try something new and get a pair of the ZBunny Beach Sandals! Cuuuuute shoes! Just signed up for emails & liked 'em! I'm loving all the ballet flats! So pretty. Liked on FB and signed up for the newsletter! :) Such cute shoes, ahh. Tough choice for my favourite... I LOVE the Brities Oxfords and the Shiny Dance with Bunny Fashion Sneakers :) Thanks for the giveaway! 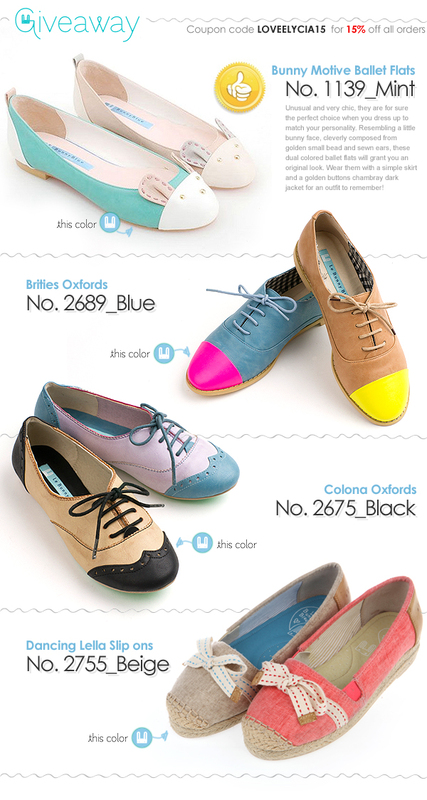 my favourite are the colona oxfords! I liked Le Bunny Bleu on fb and signed up for their email! And, it was tough to pick, but my favorite pair from Le Bunny Bleu's website are the Colona Oxfords. Eeee! I LOVE Le Bunny Bleu!!! I liked them on Facebook and also signed up for their e-mail! Bunny Motive Ballet Flats are my favorite. <3 All of the shoes are adorbs, but these have always taken the cake for me!!! I like the hadde ballet flats the best. I absolutely love the Brities Oxfords in carmel! I liked Le Bunny on Facebook! I love the Brities Oxfords!! So awesome. Liked on facebook and signed up! My favourite shoes are the brities oxford! The Brities Oxforda are too cute.I love the style. Alexis_mcginty@yahoo.com I also liked on fb. So hard to choose a favorite. >.< But I love the Colona Oxfords. Really pretty. I hve liked and sign up! Personally I really like the Colona Oxfords. And they're vegan!!!! I'm also adding the bunny motive ballet flats in the shopping page I write for the Belgian vegetarian society (www.vegetarianism.be) in their magazine, because they are too cute and they are vegan! I signed up for the email! I love the Bunny Motive Ballet Flats in mint! Signed up to the mailing list and liked on facebook! I liked Le Bunny Bleu on facebook and signed up for the mailing list. Oh man, ridiculously cute! I liked on facebook, because how could I resist!? I have liked Le Bunny Bleu on Facebook, and have subscribed by email. My favourite shoes are the mint bunny motive ballet flats, they are adorable! i have liked on facebook, and subscribed by email! my favourites are the Bunny Leather Boat Shoes v.02 in light pink! Liked them on Facebook! Gosh those shoes are adorable! Subscribed to their e-mail list.